The rotating magnetic field offers in addition to the switched and alternating magnetic field another possibility to manipulate magnetic nanoparticles (MNP) that are dissolved in an aqueous solution and relax via Brown. Thereby a magnetic torque between the MNP’s magnetic moment and the rotating magnetic field causes a rotational motion of the particles, which possesses the frequency of the rotating field. In contrast the MNPs in an alternating magnetic field change their magnetic moments directions accordingly the applied field and field frequency without producing a defined rotational motion. The rotation of the MNPs and their magnetic moments, respectively, exhibits a phase lag φ according to the rotating magnetic field (Figure 1) that is mainly caused by the rotational friction between the particles shell and the aqueous media. Moreover the phase lag φ also depends on the rotating field frequency and amplitude as well as the aqueous media’s parameters (temperature, viscosity, charge). In the case that these parameters are constant and known, respectively, the measurement of the phase lag between the rotating magnetic field and the nanoparticle’s magnetic moment enables an analysis of the relation between the hydrodynamic size and the magnetic moment of the MNP. In contrast to the alternating field the generation of a rotating field requires a 2-axes Helmholtz coil system (Figure 1 ). Figure 1 : Helmholtz coils for the manipulation of MNP with alternating and rotating magnetic fields. Here, the two Helmholtz coils are adjusted perpendicular and supplied by two sinusoidal currents, that are 90° phase shift to each other. The principle dependency of the phase lag on the rotating field frequency and amplitude is depicted in Figure 2 for an aqueous suspension of iron oxide nanoparticles with a hydrodynamic diameter (particle inclusive shell) of about 120 nm. Whereas an increasing field frequency causes a higher phase lag an increasing field amplitude results in a shallower phase lag rise. In the case of the alternating magnetic field a phase lag for the fundamental frequency can be measured. However the dependency on the field amplitude compared to the rotating field is smaller, which results in a slighter spreading of the phase lags with the field amplitude (Figure 2 ). These measured phase lags are recorded with a fluxgate-based measurement setup developed at our institute which enables the analysis of MNP dynamics in rotating and alternating magnetic fields with a field frequency and amplitude of up to 5 kHz and 10 mT, respectively. 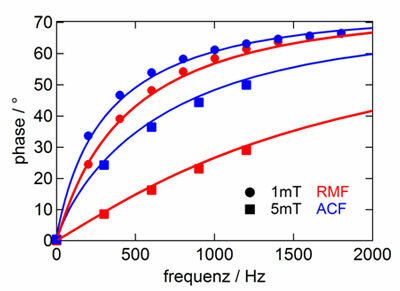 Figure 2 : Measured (markers) and simulated (lines) phase lag of an aqueous iron oxide nanoparticle suspension with a hydrodynamic diameter of 120 nm in a rotating (RMF) and alternating (ACF) magnetic field.